My son has three of the Green Toys brand vehicles in his ever expanding toy collection. As he’s becoming more and more interested in cars, trucks, and planes, these toys are becoming a bigger hit in our house. The construction is really solid with no sharp burs or ragged slicing edges. They had held up extremely well to drops, smashes, silly ride-on attempts, sticky fingers, angry meltdown hail Mary passes and more. The Green Toys Air Plane is so much fun. My son walks (or runs) around the house with this toy, making it fly through the air. He sticks one of his animal figurines in the pilot seat (although not always successfully) and flies it around the house. He’s only 21 months old right now so the play is limited, but this is a favorite and I can see him playing with this for many years. Watching him awkwardly pilot it is adorable as our the whooshing sound effects he makes. The Green Toys My First Tug Boat bath toy is something we use in the bathtub occasionally. It’s fun to fill it with water and let it sink, then dump the water and let it float. My son hasn’t quite gotten into playing pretend with this one just yet, but I’m sure as he grows up this will be more fun. Right now he just ignores it. It also doesn’t help that we don’t have a tub, so baths consist of about 1-2 inches of water in the bottom of our shower. We got this boat thinking it wouldn’t need a deep bathtub and it doesn’t really, but ultimately baths aren’t baths without a tub!! Someday, I hope! 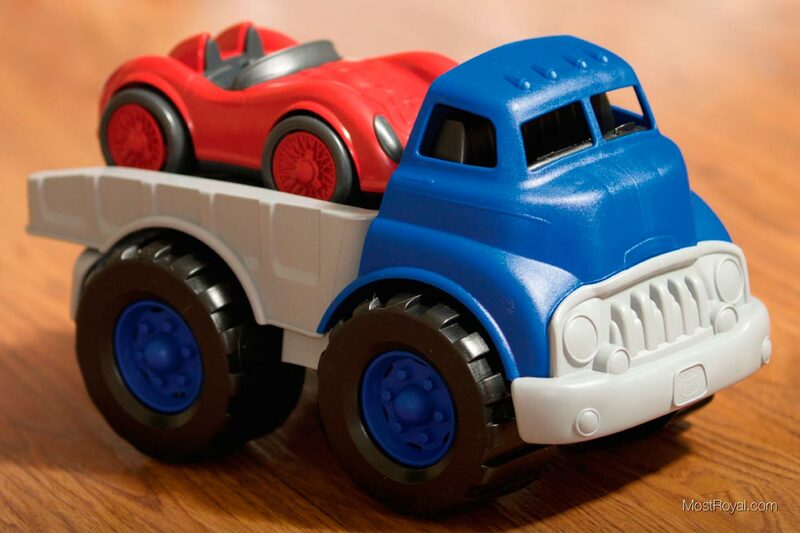 The Green Toys Truck and Race Car are lots of fun for my son. I will admit that these weren’t as popular as the plane at first but he’s recently been playing with them more. Technically he doesn’t play with them together much yet. The car he drives around the floor and the truck he tends to sit on and tries to ride. This is rarely successful but leads to lots of entertaining tumbles! Recently his animal figurines have been hitching a ride on the back of the truck. One of the things we love about this set is that you get TWO toys for the price of one. Vroom-Vroom! The Green Toys are great fun. They are well made and they have so many different options. It’s hard to resist the Space Rocket we saw at the store a few weeks ago, but it can wait… his birthday will be here soon enough!